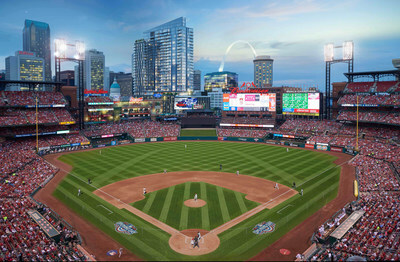 ST. LOUIS, Jan. 10, 2019 /PRNewswire/ -- The St. Louis Cardinals and The Cordish Companies are excited to unveil a new look inside One Cardinal Way, the 29-story luxury residential tower under construction in downtown St. Louis as part of Ballpark Village's $260 million second-phase expansion. Those interested in living at One Cardinal Way can now view 360° tours of each apartment home online at OneCardinalWay.com. The newly updated site features an interactive property map that allows visitors to search for available units and take virtual tours showcasing each apartment's floorplan, finishes and one-of-a-kind views of Busch Stadium, the Mississippi River, the St. Louis skyline and the Gateway Arch. In addition, the site offers updated and comprehensive information about One Cardinal Way's features and amenities, as well as the ability to apply online for an apartment. Those interested in living at One Cardinal Way can now view 360 degree tours of each apartment home online at OneCardinalWay.com. One Cardinal Way will open next year as part of Ballpark Village's $260 million second phase expansion. The newly updated One Cardinal Way website features an interactive property map that allows visitors to search for available units and take virtual tours showcasing each apartment’s floorplan, finishes and one-of-a-kind views of Busch Stadium, the Mississippi River, the St. Louis skyline and the Gateway Arch. In addition, the site offers updated and comprehensive information about One Cardinal Way’s features and amenities, as well as the ability to apply online for an apartment. "With the launch of the new One Cardinal Way website, we're excited to offer a glimpse of the remarkable views the tower will offer," said Bill DeWitt III, President of the St. Louis Cardinals. "The anticipation is building as the phase II construction progress continues on schedule." 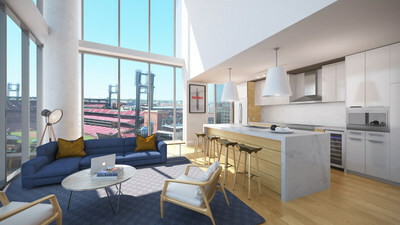 "One Cardinal Way will be one of the Midwest's premier residential experiences and will offer a completely new way to experience Ballpark Village, Busch Stadium and downtown St. Louis—and the images we are releasing paint a great picture of what that experience will feel like from the inside," said Nick Benjamin, Vice President of Development and Managing Director of Multifamily Housing for The Cordish Companies. "We are really proud and excited to be showing this progress with the St. Louis community as we progress towards our 2020 opening." The Cordish Companies' origins date back to 1910 and encompass four generations of privately-held, family ownership. During the past ten decades, The Cordish Companies has grown into a global leader in Commercial Real Estate; Entertainment Districts; Sports-Anchored Developments; Gaming; Hotels; Residential Properties; Restaurants; International Development; Coworking Spaces; and Private Equity. One of the largest and most respected developers in the world, The Cordish Companies has been awarded an unprecedented seven Urban Land Institute Awards for Excellence for public-private developments that are of unique significance to the cities in which they are located. The Cordish Companies has developed and operates highly acclaimed dining, entertainment and hospitality destinations throughout the United States, many falling under The Cordish Companies' Live! Brand, highly regarded as one of the premier entertainment brands in the country. Welcoming over 50 million visitors per year, these developments are among the highest profile dining, entertainment, gaming, hotel and sports-anchored destinations in the country. Over the generations, The Cordish Companies has remained true to the family's core values of quality, entrepreneurial spirit, long-term personal relationships and integrity. As a testimony to the long-term vision of its family leadership, The Cordish Companies still owns and manages virtually every business it has created. For more information visit www.cordish.com or follow us on Twitter. "The Cordish Companies," "The Cordish Company" and "Cordish" are trademarks used under license by independent corporations, legal liability companies and partnerships ("Cordish Entities"). Each Cordish Entity is a separate, single--- purpose legal entity that is solely responsible for its obligations and liabilities. No common operations or financial interdependency, and no intermingling of assets or liabilities of the Cordish Entities exists, or should be deemed to exist, as a result of the potential common reference to multiple independent entities operating under the names "Cordish," "The Cordish Companies" or "The Cordish Company" here or elsewhere.